Crawford Arch is a thin spindle of an arch. From the valley floor it looks like a toothpick leaning against the massive rock formation it stems from. Until someone told me you could hike to it, it never occurred to me that it was possible to see it up close. But from that moment on, I wanted to see it for myself. That day came in March. A group of us met up in the pre-dawn of a cold morning and set out on what would be a 12 hour day hike up to the arch and back down. We made our way in the warm glow of the morning sun, enjoying the solitude and beauty of the backcounty. Upon arriving, the arch was even more spectacular than I had imagined. It looked like the rock wall just sprouted a root. 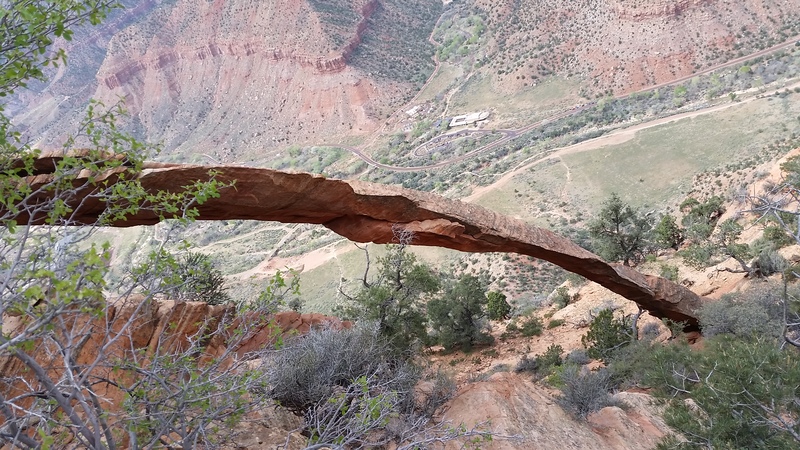 The arch looks delicate, fragile – but when you get to the top of it, it’s a good 10 feet across. 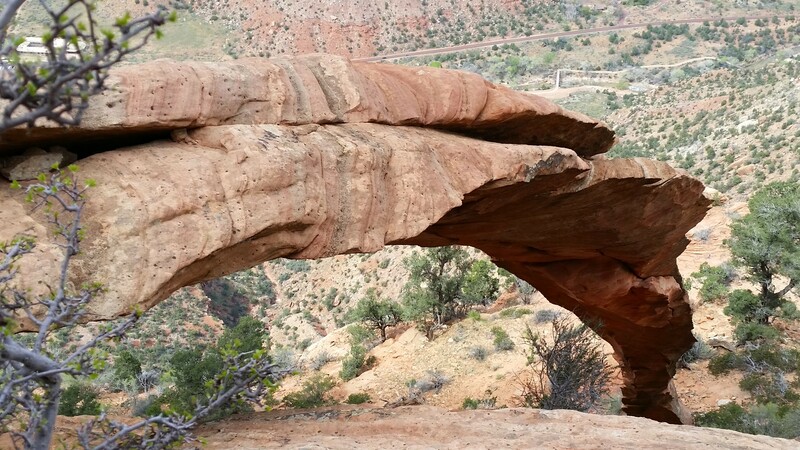 I made my way out to where the arch starts to curve and sat down, the first of the group to perch atop it. I waved to my husband to join me for a photo. He climbed up and then hunched down, not sure he wanted to join me out there questioning whether it would hold his weight. My friend who was taking the photo for us, not realizing that all he had to do was touch the screen of my phone for a photo, and the fact that the sound was off and it doesn’t show a screen shot once a photo has been taken, caught the entire sequence of me cajoling my husband out next to me. I have many fears, but fear of heights is not one of them. 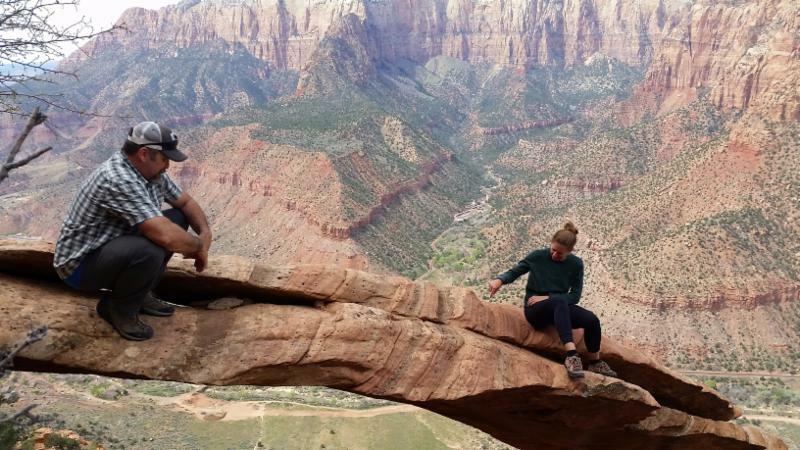 This lack of fear comes in handy for outdoor adventure that includes high elevations and sheer drop-offs like climbing, canyoneering, and peak bagging. But I do have different fears and a healthy sense of danger. If something makes me nervous, I will not push it. At no time was I nervous on that arch. As I read my friend’s comment I couldn’t help wondering what her friends had been doing the moment before they fell. Were they goofing around or doing something risky? It’s possible. In my mind, the only thing that would make the arch dangerous is a lack of humility and safety. Life is inherently risky. It is easy to assign danger and risk to activities like climbing because it “looks” dangerous, but we could die in a car accident on the way to the crag. Obviously my friend suffered from these accidents and has determined that hiking to Crawford Arch is not worth it. And maybe it’s not. But in my mind, there is a fine line between being safe and living in fear. Life is a delicate and exquisite thing, but the pay off comes in spending it. A spider would never catch its prey without the intricate workmanship of its fragile, yet strong web. Life amounts to the decisions we make. Will I climb or decline to try because I might look stupid if I can’t do it? Will I go for that peak or just look at it from the ground? One decision is not better than the other, but your life will amount to the decisions you made; and that culmination will not matter to the world, but to you. In the secret recess of your mind will you wonder, “What if I had tried?” Not everyone has a burning desire to test their limits, but some do, and if that is you, answer the nagging question, “Do I have what it takes?” Swallow your pride and try. Be willing to change who you are now for who you want to become tomorrow. It’s such a cliché to say that life is short, but if you are older like I am, that phrase has taken on some real meaning, and if you are young, you will discover just how true it is in time. We never know how long we have. If you have an aching desire to try something, take the steps to achieve it. No one climbed Half Dome before learning how to climb first. Overcoming fear is a process like anything else, but as you learn and grow and become stronger, the fear abates and turns into knowledge, confidence, and possibly expertise. In order to achieve great things we must dare great things, even if the beginning step is putting on a harness and climbing a wall at the climbing gym, because each step is a personal victory. Everyone has to start somewhere. For me, it was getting over my fear of looking stupid. My first time climbing I climbed with a 5.14 climber that I didn’t know very well. I was sweating and nervous and terrified. But I did it. I was 36. That decision changed my life. Ultimately the worth of attempting something challenging or dangerous is personal. 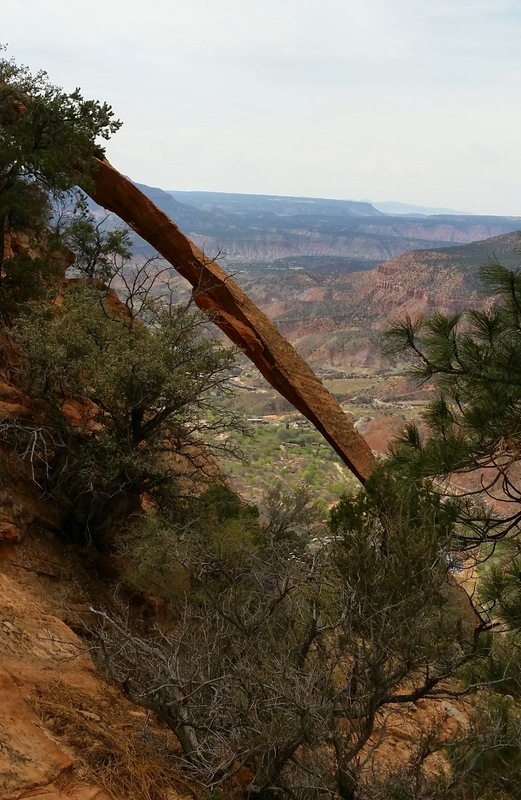 My friend decided that the risks of seeing an arch 2,000 feet up the side of a mountain are not worth it. It was worth it to me. The climb to that arch, the 300 foot rappel to get down, the wind whipping through my hair and an entire golden canyon beneath my feet are the moments I live for. For me, life is most beautiful in those moments of decision when I dare to live. 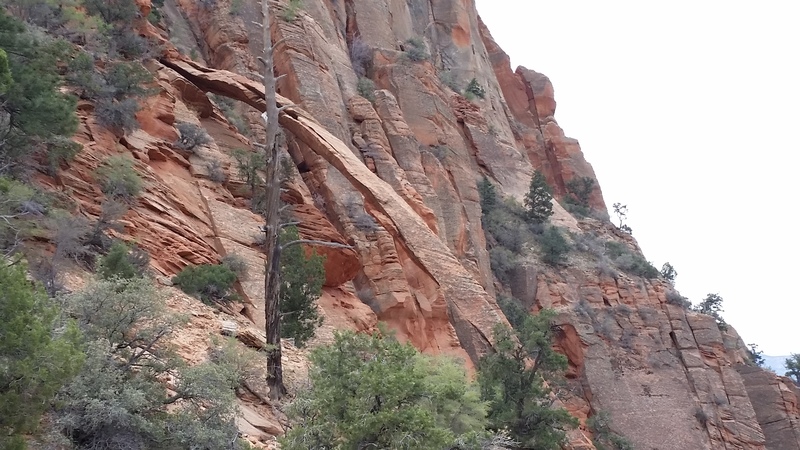 Posted on May 1, 2015, in Recreation & Adventure and tagged canyoneering in zion, climbing, daring great things, difference between safety and fear, outdoor recreation, Philadelphia Rock Gym, rappeling, rock climbing, rock gyms, zion national park. Bookmark the permalink. Leave a comment.